Recently for my daughter’s 4th birthday we tried out Bibbidi Bobbidi Boutique at Disneyland Resort for the first time! It definitely exceeded my expectations. I wanted to share our experience going, particularly ordering the Minnie Dot Package. A lot of people I discovered after I posted pictures of my daughter’s makeover on Instagram weren’t familiar with the Minnie Dot Package! Typically one of the princess packages are ordered, so I thought it would be fun to try something a little more different. Minnie Mouse bun hair-do with glitter and bow. Bibbidi Bobbidi Boutique backpack where they put their leftover makeup palette, face gems, nail polish, comb, and make-up wipes and shampoo for later that night. When you check in, you wait at the secret Bibbidi Bobbidi Boutique entrance for your “Fairy Godmother in training” to bring you inside and get you ready for your makeover! They then take you to dressing rooms, where they reveal that they have your dress of choice waiting for you! Amelia was thrilled when she saw her red Minnie Mouse dress waiting for her! The first size we picked was too small, but they were more than happy to bring another size to try on for the perfect fit. In her dress, ready for her makeover! Then our fairy godmother in training took Amelia to a hair salon style seat, with a storybook looking bench in front of it for mom and dad to sit on and enjoy watching their little get pampered! They have the a fairy godmother in training working on their hairstyle, while also talking to them about fun facts about Disneyland. Our fairy godmother in training Kathy was super sweet, and truly treated Amelia like royalty! Another fairy godmother in training comes by to do nails and makeup while their hair is being done. Next, they get shimmer added to their air, a hair accessory, and then the fairy godmother in training waves her wand while curtains are magically opened up by Cinderella’s bird friends to show a mirror for the Bibbidi Bobbidi Boutique big reveal! It was Disney magic at its finest, and our fairy godmother in training was so incredibly nice. My daughter loved her look, and all day she got compliments about her Minnie dress and especially her Minnie Mouse buns! Another reason I loved the Minnie Mouse Dot Package was that you can get some amazingly cute pictures of the outfit, since Disneyland has Toontown and Minnie’s house for the perfect immersive photos. She was so thrilled to meet Minnie Mouse at her house to show her that they were twinning! She loved it so much that she even requested next year we go back to Bibbidi Bobbidi Boutique for her 5th birthday celebration. 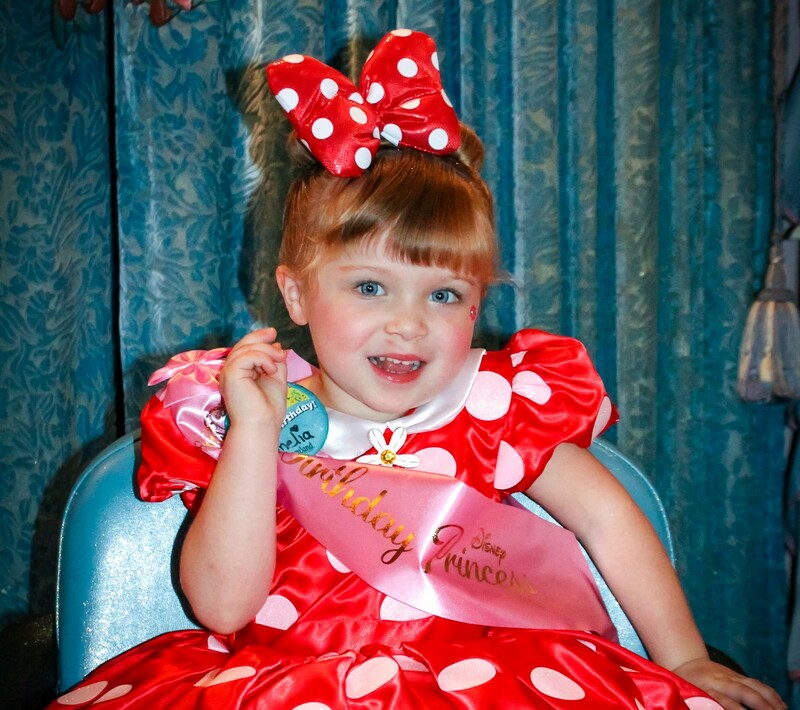 To learn more about what we did for Amelia’s birthday celebration, along with tips and ideas for celebrating a child’s birthday at Disneyland, you can visit my post here.